Upon meeting her, you will instantly feel right at home. From her friendly smile to her amazing home cooking, this is the perfect place to relax and enjoy Balinese hospitality. That is how the owners of Wild Ginger, Putu and Nyoman, sincerely feel about their guests. Putu has been working as a helper in the kitchen since she was still a young girl going to school, and as she got older she has had the great opportunity to work for Nomad and Cahaya Dewata Resort Hotel. As their children were growing older they realized that they wanted to give their children opportunities that they didn’t have when they were growing up. 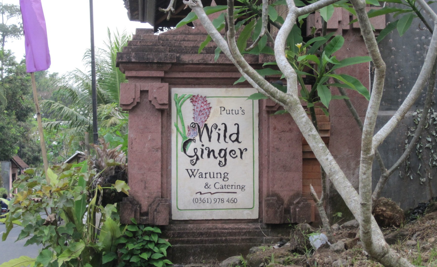 That is how the concept for Wild Ginger was born. They had to knock down their family temple and rebuild it on top of the Warung (which was unheard of at the time) to make room. It took a lot of love, support, and hard work from many people to make it happen, but the result is really worth visiting. 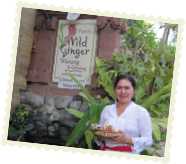 Because Wild Ginger was built out of love (for Putu and her cooking with the help of some very kind friends) they would like to share as much love as possible to the people they meet in Bali. If you are coming through Ubud, Bali, please don’t miss out on one of the greatest meals you’ll have on the island. When you first walk into Wild Ginger you notice how cozy the place is. Not too many tables and good legroom. Then you sit down at the table you’ve chosen and get handed a menu by a smiling face that is warmly welcoming you. When you’ve decided on the meal you want, that’s when the fun begins. You will hear the sizzling sounds of the kitchen while you wonder what Putu’s making. Then the smell hits your nose, and you can’t believe just how good it smells! When the food is finally placed before you, you are amazed by how wonderfully it is presented to you. And then, the first bite. Oh, you must pause because your taste buds are so happy you just have to give them a moment to catch their breaths. And then that moment is over and somehow your plate is empty and your belly is full. You debate about dessert and you get one anyways, and once again you are blown away by the artistry that Putu has put into the dish, and you wonder how you could have lived without this place before.